October 8 was National Pierogi Day. Pierogi (the plural form of the word--pierogies doesn't exist), is a delicacy of Eastern Europe (particularly Polish, I think) In the early 1900s these circular pockets became popular in the northeast and the Midwest. 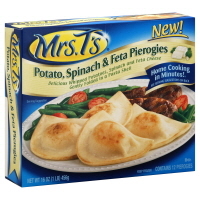 Mrs. T's Pierogies (YEAH, YEAH--I know what I said earlier) is the largest producer of pierogi in the United States. And are the only ones I've ever eaten. 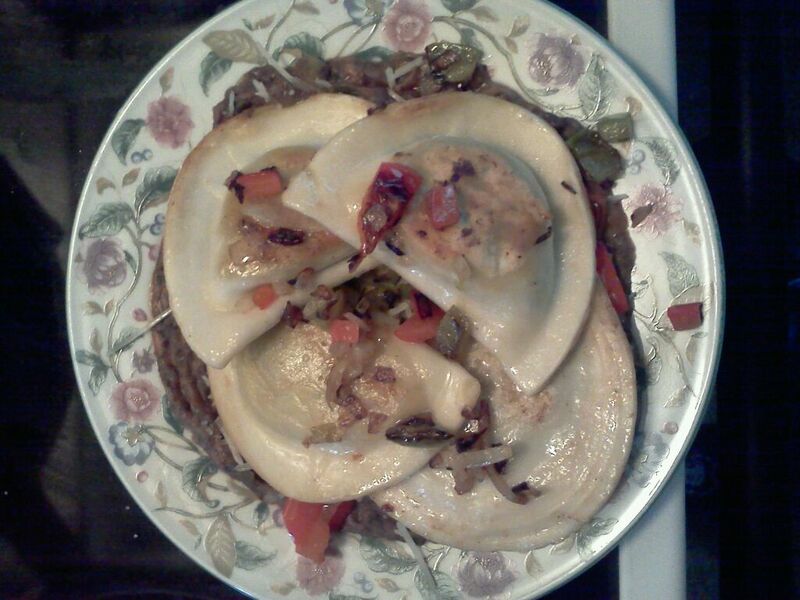 Pierogi are a dish consisting of boiled potato dumplings stuffed with varying ingredients. I believe the best way to eat them are sauteed in butter. Harris Teeter has them on sale, Buy One Get One Free--so I've got plenty to last me at least until November next week. Pierogies. It's what's for lunch. *Saute frozen pierogi in skillet with butter or oil. Turn occasionally until golden brown on both sides, for 8 minutes. *Bake frozen pierogi in a preheated 400 degree F oven on a baking sheet coated with nonstick spray. Spray both sides of the pierogi. Bake 18-20 minutes until pierogi are puffed and nicely browned. For best results, turn pierogi over halfway through bake time. Place the garlic with the water, paprika, and cumin and mix together in a food processor. Add the beans and process until smooth. Transfer beans to a preheated skillet on medium-low heat. Cook, stirring constantly until the liquid is gone and the beans are almost dry. Add the lime juice, scallions, and black pepper and stir well. Remove from heat and allow to cool to room temperature. Stir in Parmesan.